I have been a professional woodworker since 1985. I live and work in Austin, Texas. Over the years I developed the name WoodMan as I quickly became the “go to” person for many when there was a question about tools, techniques, wood or basic fabrication. Go “Ask WoodMan!” was the common refrain. I have both a business statistics and a math degree from University of Texas at Austin. After a couple years working a desk job in a cubicle I realized that was not the life for me. I am a self-taught woodworker who started making furniture in my apartment. My first tool was a skill saw. In the early 80’s I started my own company. I wasn’t long before I found my niche building high end custom furniture. I have been posting free videos on YouTube since 2010 . There are well over 1,000 available with many more in the works, and they will always be free. But, if you find value in my videos and want to help defer some of my video costs, donations are always appreciated. Just click the button below and donate in any amount you choose (No PayPal account needed). Instructional videos for woodworkers or anyone who works with their hands; welders, craftsmen, construction workers, home builders, and also those involved with the design or fabrication industry. I started uploading videos in January 2010. I have hundreds of videos in the que and continue to tape every week. Please subscribe to my channel so you won’t miss out on all the videos to come. 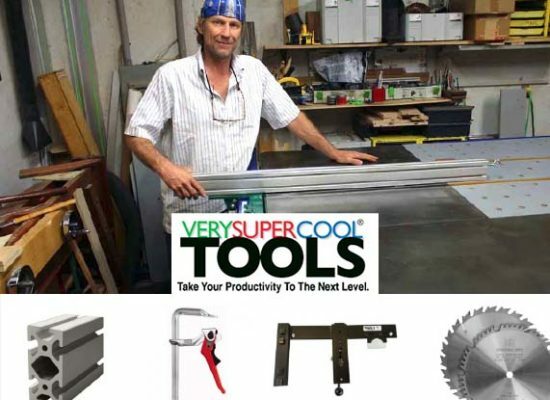 VerySuperCool Tools products are designed to make the tools you already own perform better.